Distribution: Sacramento Orcutt grass is endemic to California and known from fewer than ten occurrences, all in Sacramento County. Currently it is not known to exist in the Natomas Basin; the nearest known population is in southeastern Sacramento County, approximately eight miles (thirteen kilometers) from the basin. Habitat Requirements: Sacramento Orcutt grass is found in a limited elevation range of approximately 100″“350 feet (30″“100 meters) and grows in deep vernal pools that remain flooded for relatively long periods of time. It is associated with ancient alluvial soils, such as prehistoric floodplains. 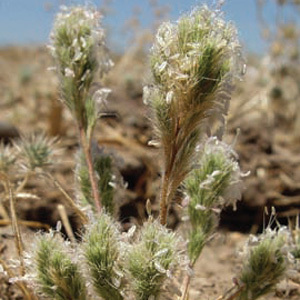 Demography: Sacramento Orcutt grass is a small annual herb in the grass family (Poaceae) that blooms from April to July. Like some other plants in the Orcuttieae tribe, Sacramento Orcutt grass produces different leaves during its juvenile, aquatic stage. Sacramento Orcutt grass grows with other vernal pool plant species such as goldfields (Lasthenia spp.) and coyote thistles (Eryngium spp. ).